For those who were on bikes in the eighties or nineties, bike computers back then were simple machines with basic functions. The data generated revolved around limited parameters; speed, elapsed time, trip distance, total distance/odometer and time of day. Simple Avocet and Cateye models were for many people their first mechanism to provide data during training rides and races; over time, additional features were added such as cadence and heart rate, with companies such as Polar also entering the field and helping ramp up the technology. Logging power also became increasingly popular thanks to the products of manufacturers such as SRM, Saris and others. More recently, the bike computer market headed in a different direction with the integration of GPS into the device. The most expensive models make it possible to display maps, much as a car navigation system does, but the more usual application is to enable users to better track their rides and performances. Garmin is the market leader in this area of the computer market, and this plus several smartphone apps have transformed the way people view and monitor their training and racing. Websites such as Garmin Connect, Runkeeper, Strava and others have meant that logging training is now far, far away from the old pen and paper notations meticulously kept by some. Instead, incredibly intricate data from rides can be logged in seconds, with second by second juxtaposing of speed, location and other data being made available, graphs being generated and tweaked with the click of a mouse and, best of all, compete maps being displayed with the training or racing route plotted accurately. This data can be shared with coaches and fellow riders and, with websites like Strava, comparisons can be made with others who may have covered the same climbs and courses in the past. Indeed the latter is one of the big growth areas, with a massive upsurge in the numbers of those using the service. One of the key features is that personal bests for climbs can be recorded and ranked in comparison to others who have done the same in the past, creating an online race of sorts. 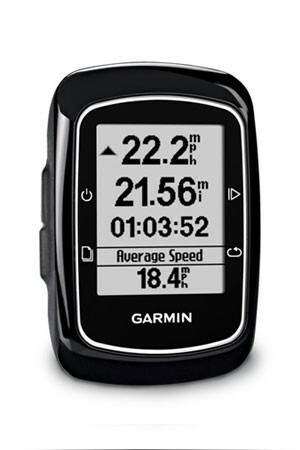 With a recommended price of $149.99/£129.99/€149.99, the Garmin Edge 200 is the least expensive of the company’s bike computers. Apart from cost, ease of use is also a big selling point; setup is extremely simple, with no calibration necessary before use. Because speed, distance and other computations are detected via GPS movement rather than using on-bike magnets and sensors, there’s no need to enter wheel size. In fact, installation is merely a matter of clicking the computer into the provided bike mount. This is held onto handlebars or stem by flexible bands; two mounts come provided, and extras can be purchased for different bikes. Being wireless, the Edge 200’s consequently quick and easy to swap between different bikes if necessary, such as between road and MTB machines. Prior to use, the computer should be charged via the supplied plug and cable [three hours charging provides enough battery life for up to 14 hours]. Then, after switching it on, some basic details should be entered such as gender, date of birth, height and weight. After that, you are ready to go. Once started, the unit displays data in four separate lines. The top one shows current speed, the second elapsed distance, the third elapsed time and the final one a mix of data. 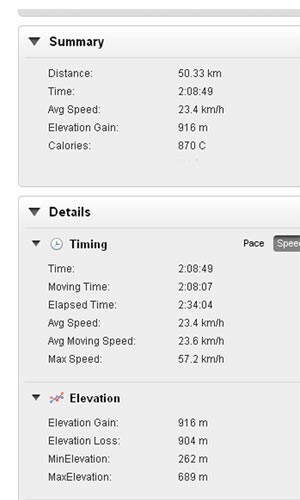 The latter shows a number of measurements, namely average speed, ascent and approximate calories burned. The display is extremely clear and the numbers easy to read; of great use when training at night is the ability to turn on a backlight, thus making it possible to see the data even when it’s completely dark (pictured). Unlike those aforementioned computers from the eighties and nineties, the unit is also continuously recording data when it is running; speed, altitude and position are all calculated and memorised, and viewable when the ride is finished. More of that later. There are four buttons on the unit and each of these has a function while moving; top left turns on and off the display, top right starts and stops the timer. The bottom two are more useful, with the one on the left cycling through the average speed, ascent and calorie displays. The button on bottom right is to activate the lap counter. This is used to mark any start and stop points you wish to use; for example, the bottom and top of a hill you want to test your climbing on. The computer continues to record the usual data while in this mode, but also creates subsets which are viewable afterwards. With this function, you can determine time, distance and average speed during those laps. The Edge 200 also some neat auto settings. Firstly, it’s possible to set the lap timer to activate by GPS position. It means that you can instruct the computer to start/stop a lap measurement whenever it detects the bottom and top points of that test hill. Once that’s done, it will reduce the need for you to press buttons, enabling to get on with tackling that hill or whatever section of road you want a specific measurement of. The second option is to activate the auto lap counter by distance. You can instruct the computer to take the lap measurement over segments of (say) five miles/kilometres in duration. The auto functions can also limit the need to press the start button during the course of a ride. Auto pause does what it suggests; when stopping at traffic lights, it turns off the time counter. Resuming motion once the lights turn green will cause the timer to click into use once again. Auto scroll means that the fourth line of display will automatically scroll through those measurements of average speed, ascent and calories. A final automatic setting pertains to alerts. The unit can be programmed to emit a notification when a predetermined target is reached; this can be number of kilometres, time elapsed or even calorie count. Another neat function is the ability to create what is titled courses. This can be done in one of two ways; by riding a route and then saving it afterwards as a course, or by pre-determining it on the Garmin Connect website or other sites which offer the ability to do so. The latter is incredibly easy; simply click on a map to create a start point, then click on successive points along the route. The online software will join the dots to form the route, ensuring it follows the roadways, and also provide feedback about distance. 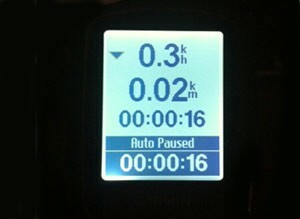 It’s possible to set an average speed and, once the route has been downloaded to the Garmin Edge, to ‘race’ that pace. Similarly, if using a route recorded previously while on a ride, it’s possible to race against that speed. The Edge 200 gives continuous feedback about whether you are faster or slower. It’s therefore possible to compete against yourself over time, seeing how you are improving on a set course. While the Edge 200 doesn’t include specific GPS maps for an area, the courses function gives a rough outline on the screen when turns need to be taken to stay on a course. When riding in unfamiliar terrain, it’s possible to pre-load a course beforehand and simply follow the onscreen hints. The Garmin Connect website also offers the possibility of downloading courses created by other people or, if you wish, by members of the Garmin pro team itself. If you are in the same location, you can in effect ‘compete’ against those. One of the biggest benefits of having a GPS computer such as the Edge 200 is the ability to upload training/racing rides afterwards. This is done by connecting the device to a computer via the supplied USB cable and going to the Garmin Connect website. Once upload is selected and the activity pinpointed, it takes seconds to complete the data transfer. That generates a raft of data, displaying parameters such as speed, time distance, elevation gain/loss, estimated calories burned, and also displays graphs for these. The elevation tracking in effect draws a profile of the route covered, while a map is also generated which plots the exact route followed. Clicking the ‘player’ tab enables playback of the route, showing the specific speed, time and elevation on the map and a graph. All this may sound complicated, but it’s quickly learned and provides a large deal of information. The Edge 200 is an excellent introduction to GPS cycle computers and enables the user to track ride data, both during and after the activity. When combined with websites such as Garmin Connect, it generates a lot of extra information and functionality. 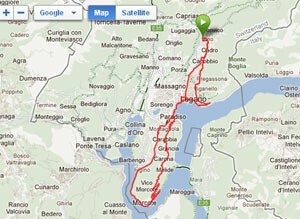 In addition, viewing the stats and routes taken afterwards is very motivating. It provides an additional sense of satisfaction after completing a training ride or race, and encourages the user to get back out again the next day and add to the bank of data. Its bigger cousins such as the Edge 500 offer scope to track additional data such as heart rate, cadence and, with the right equipment, power. That comes at a cost, though, and adds more complication to the process. The Edge 200 has been designed to be both cheaper and more straightforward to use, making it ideal for many of those new to GPS technology in cycling.